Peters: Any Eustace-led NDP will lose the coming Elections! That is the declaration of Jonathan Peters, former Trade Minister under the Sir James Mitchell-led New Democratic Party (NDP) administration, who over the last few months has been on an aggressive campaign to unseat Eustace as the party head. Speaking to SEARCHLIGHT earlier this week, Peters, who has launched an expensive public relations campaign aimed at securing the leadership of the NDP, said that while Eustace may be an accomplished economist he is devoid of leadership and political skills. However, Peterâs efforts are being greeted with resolute resistance by Eustace. Speaking at a town hall meeting last Thursday, February 13, Eustace read the riot act without giving names. âThere are some people who feel that they should take over the NDP … persons who ran (for elections) a long time in the past, who neglected this party and have suddenly come back. Nobody wants to work. Everybody wants to be a candidate. Eustace said that while he has no problem with persons who were associated with the party in the past wanting to make a contribution, they canât come when the NDP is in a stronger position and want to be the leaders. 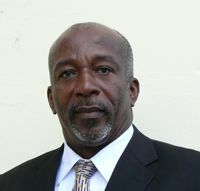 Regarding his own position as president of the party, Eustace reiterated that in 2006 he put his position up for election before it was constitutionally due and he won – and wonât be doing that again! Eustace said that 578 votes separated the NDP from eight seats in the 2005 elections, and the foundation is set for the next battle at the polls. âHe is nothing to the NDP,â is what NDPâs General Secretary Allan Cruickshank had to say about Petersâ leadership challenge. However, Peters has dismissed the party leaderâs position saying that he is determined to take his fight all the way. He said that he is not a âJohnny come latelyâ and is determined to lead the NDP in the next Elections, whenever they are called.